Ford on Monday said it would triple “semi-autonomous” vehicle spending and announced Traffic Jam Assist, which keeps a driver in their lane and following the car in front. 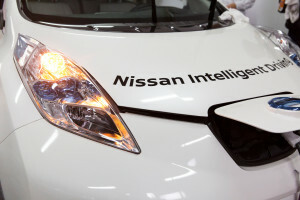 Of course, Nissan-Renault last month went one better, promising 10 “affordable, mass-market” models in the U.S., Europe, Japan and China with partial autonomy by 2020 — including the capability to self-drive on a freeway within the year. Then again, being ho-hum about a car which can keep tabs on its lane and another vehicle should tell us something about how far and how fast vehicle technology has advanced. Ford also announced Fully Active Park Assist (self-parking) for its vehicles, which should also help advance semi-autonomous technology further into the mass-market. If Nissan delivers on its promise, it’s remarkably to see how quickly luxury car features come to the rest of us. For example, Tesla already features freeway self-driving (though the human is still liable) and the Cadillac CT6 will get it (Automotive News reported it’s been delayed until 2017). Ford, however, also pledged semi-autonomy by 2020. Even if Fords and Nissans get smarter, we’re a long way off from losing all the other “dumb” cars — actually, it’s the dumb human drivers. That should keep body shops with plenty of work in the near-term — and in fact raise raise revenue in the instances where a tech-heavy vehicle is involved in a collision. And possibly in the long-term; bodyshop reported a Thatcham expert’s prediction that cars with growing levels of autonomy might not kill off the collision repair industry after all. That said, the sooner autobraking and other partial autonomy permeates the U.S. fleet, the sooner collision repairers start losing business and the risk equation — and consequently the ceiling for premiums — changes for insurers. Two mass-market OEMs heavily entering into the A.I. arms race will be something to watch in both industries.